The basic material for the Oyaide C-079 is deoxidized Phosphorus Bronze, which provides strength and a secure contact. The surface of the C-079 is thoroughly polished TWICE. Then, a super thick (1.5 micron) 24K Gold layer is plated directly onto this polished surface, and the polishing process is again applied twice. Next, the Oyaide C-079 receives the final Palladium plating (0.3 micron), and is again polished twice. The combination of these polishing processes, platings, and thicknesses of platings ultimately leads to the final sound character. For the body of the Oyaide C-079, Oyaide has chosen high density PBT, mixed with 30% glass filler. This combination was used to maximize rigidity, thermal stability and provide high resonance absorption. The outer shell is Polycarbonate. 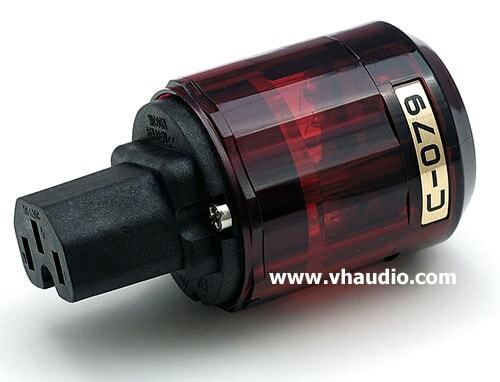 In our experience, and based on the feedback of our customers, the Oyaide C-079 male AC connector has a tonal character that is very natural sounding to slightly warm, with a presentation that is a bit laid-back. Highs are sweet, yet nicely extended. A great match for digital components, SS gear, or systems that would benefit from a bit more warmth, without sacrificing a great deal of resolution.